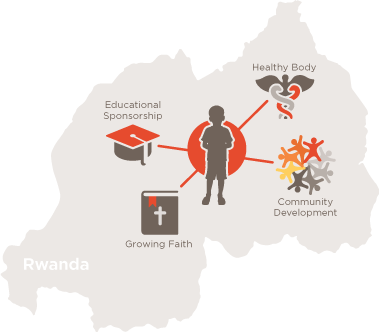 Since its beginning in 2001, Africa New Life has partnered with local churches to impact children of Rwanda and energize congregations. As a result, nearly 10,000 students are now sponsored! Churches have been built. Medical care is being administered. Pastors are being educated. Bellies are being filled. Widows are receiving vocational training. Hope is being restored and lives are being transformed. YOUR CHURCH IS INVITED into the incredible story God is writing in Rwanda. To get a glimpse into the full scope of impact of this ministry, please take a few minutes to watch Daniel’s story below. Africa New Life works to empower families so they can rise out of poverty and have hope for the future. A truly transformed life happens in relationship with Christ. Africa New Life is committed to spreading the Gospel of Christ in Rwanda. We believe that, when given the opportunity to receive an education, children can escape the cycle of poverty. Africa New Life exists to transform lives and communities through preaching the gospel of Jesus Christ and acts of compassion. As you saw in the video, focusing on child sponsorship means far more than simply putting a child through school. Ensuring that children have the greatest chance for success also means putting substantial time and energy into building a stable home life, faith, healthy bodies, and community development.